The vice-chairman of the National People's Congress Standing Committee told top legislators in Beijing yesterday that sewage discharge volume has increased despite over 111.5 billion yuan (US$13.5 billion) having been spent on water pollution prevention and control since 2001. "Last year, water from half the tested sections of <?xml:namespace prefix = st1 ns = "urn:schemas-microsoft-com:office:smarttags" />China's seven major rivers was undrinkable because of pollution," Sheng Huaren said in his report on the implementation of the Law on the Prevention and Control of Water Pollution, adopted in 1984 and amended in 1996. Between 2001 and 2004, a total of 3,998 water pollution accidents occurred in China and the water quality of the country's major rivers has continued to worsen. 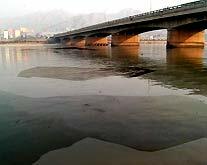 The Haihe, Liaohe, Huaihe, Yellow and Songhua rivers were the most seriously polluted, according to the State Environmental Protection Administration, and Sheng said the state of the Yangtze and Pearl rivers was not much better. "The water quality of the Yangtze faces the possibility of worsening," said Sheng, and although the Pearl River is in good condition as a whole, its Guangzhou section is seriously polluted. According to the Ministry of Water Resources, over 300 million rural residents do not have access to safe drinking water, and about 190 million people drink water containing harmful contaminants. Sheng urged the government to set detailed goals to prevent water pollution and suggested more money be spent in western regions, the upper reaches of rivers and poverty-stricken areas. The report also said some progress has been made in industrial sewage discharge control. A total of 23.2 billion yuan (US$2.8 billion) has been spent to improve industrial sewage treatment capacity. Since 2000, 15,000 factories that caused severe pollution and consumed large amounts of energy have been ordered to close down. The report said urban sewage treatment capacity had also improved. Since 1999, the urban sewage processing rate has risen from 32 to 45 percent.